Post: Gaurav Akrani. Date: 11/08/2009. Comments (254). Label: Health, India, Videos. Disclaimer! Following article is not an outcome of a medical research nor mentions any scientific evidence to support its claim. Subject below is controversial in nature and is completely based on author's personal experience. Before imitating on any of the following, please do consult a registered medical professional. Author of this article is neither a doctor, nor he is involved in any health related research studies. Whether to or not to trust material below is left to you. This is for your kind information to avoid consequences, if any, arising by using information published on this website. 1. What is Balayam ? Balayam, a Yoga technique, was invented in India by ancient Rishi Munnis (Wise Sages) who were maestro Yogis (Yoga Masters) and Vaidyas (Doctors) of their time. These scholarly Indian ancestors who even excelled in science of Ayurveda and Human Physiology found Balayam as a simple solution to the most complex problem of baldness. According to them, Balayam or Nakhancha Vyayam is a perfect cure for many hair aliments, it works without any special medicine and lotion, it works without disturbing the natural state of a complex human body. Balayam is a union of two Hindi words Bal and Vyayam where Bal means Hairs and Vyayam indicates Exercise. In simple language 'Balayam' means an exercise for hairs. To be more specific, Balayam is an Acupressure therapy in which a person rubs his/her fingernails of both hands against each other to stimulate scalp's activities. This stimulation if done correctly, frequently and for a longer period of time is known to boost natural hair growth and cure MPB (i.e. Male Pattern Baldness or Androgenic Alopecia) observed in some men and women. Balayam is an acupressure therapy in which pressure points beneath fingernails called as Acupoints are manipulated by applying appropriate external pressure. As like traditional Acupuncture Therapy here needles are not used to manipulate acupoints. Logically, it is not easy for needles to penetrate through the hard shell of fingernails hence rubbing is preferred over needles in Balayam. Rubbing evokes similar pressure manipulation like that of needles but without an extra pain and inconvenience. In short, Balayam is similar to Acupuncture but without any pain, inconvenience, therapist's help and treatment cost. Balayam can be practiced by anybody irrespective of their age and gender, don't require any special instruments, guidance and caution, and can be practiced anytime as per once's own convenience. 2. How Balayam Works ? Nerves below the nail bed are connected to the scalp and regular nail rubbing stimulates blood flow and oxygen to the scalp. Frequent rubbing continuously stimulate the scalp thus rejuvenating hair follicles and enhancing hair growth by controlling DHT (Dihydrotestostrone) resulting denser, thicker and stronger hairs. Balayam even stops graying of hairs. It is also known to soothe head aches and heal neurological disorders of brain. To most people Balayam (Ancient Nail Rubbing Exercise) seems like a joke at first but my experience says it's the most effective yoga for hairs. It is the best natural remedy to control hair fall and regain lost hairs. Balayam can be practiced by anybody irrespective of their age and gender. In many cases, it works slowly but gently, gives expected results only after a long regular practice of at least 6-7 months. To get expected results do nail rubbing exercise daily for an hour or in four sessions of 15 minutes each. People with high blood pressure should not practice balayam since it may aggravate their blood pressure. 3. Sapta Kriya - How To Cure Hair Loss Naturally ? to heal baldness and other hair related problems. Balayam has worked for me and my father. However, regularity is a must and very important to see expected results. You will notice its results after 6 to 7 months. Balayam - An ancient miracle that has a nature's power to heal you perfectly. 1. Always wake up early say around morning 5 AM and then go for toilet. Throw out digestive byproducts (Acids and Toxins) via Urine and empty your stomach. 2. Drink Fresh Lemon juice (lemon+water) and don't add sugar or salt. Lemon helps you kill bad bacteria without killing Pro-biotic bacteria. 3. Go for a morning walk for 30 minutes. Walking early morning helps you inhale 'Shudha Vaayu" (Fresh Natural Oxygen) given out by Trees. 4. Practice following Hairs Promoting Yoga Asanas. 1st = Do Pranayam For 30 minutes. For guidance, please watch video in point No.5 of this article. 3rd = Do Shirshasana For 5 to 10 minutes. 1st = Drink Golden Milk. Mix warm milk with a 1/2 teaspoon of sweet almond oil and turmeric. 2nd= Apply sweet almond oil on a scalp and do gentle massage for 1 minute. 6. Sleep early For at least 7 to 8 Hours daily. Note! You must sleep and wake up early say from 10:00 P.M to 5:00 A.M in the morning. You must always sleep in a complete darkness with all lights switched off. This is very crucial since only in full darkness special hormones in the human body are able to repair and cleanse body cells naturally. 7. Last but very important principle for good hairs is that always wash your hairs only with cold and not with hot water. Prefer using a trusted brand of herbal Shampoo. These 7 steps cured mine and my father's hair problems. I believe it will cure your hair problems too. Trust nature and yoga. Start living a stress free life by effectively planning your daily activities. Please! Don't use Propecia (Finasteride), Rogaine (Minoxidil) and other similar drugs that harm more than they cure. Trust Balayam! It works !!! You will get remarkable results after a year. Please do it regularly. Thanks To Guru Vaidya - Who told me this secret for free a year ago. Verichan Kriya is an important Yog Mudra performed with Padmasana or any other asana. It helps to strengthen the coordination of mind and body. Verichan Kriya accentuates the synchronized functioning of mind controlling nerves along with the spine. Tadasana helps to create space within the body, improving the functioning of internal organs. Tadasana improves respiration and digestion in the body. Tadasana helps to provide relief in visceroptosis and backache. Vibhakat Hastpad Asana helps strengthening the arms and limbs of the body. Vibhakat Hastpad Asana detoxifies the body through spiritual healing power of yog. Vibhakat Hastpad Asana directs the blood flow towards skull, providing healthy hair and skin. It also relives the body from tension and stress. For more details visit Bharatyog.com. Shirshasana or Headstand promotes hair growth by increasing blood circulation to the head. This helps in pushing more oxygen and essential nutrients to the scalp. Apart from not following Sapta Kriya, there may be some other main reasons like unhealthy scalp conditions. 1. Painful and Itchy scalp inflammation. 2. Sores or Bumps on scalp as a result of eczema, dermatitis / rash or some undiagnosed infection. 3. Bursting and bleeding of these scalp sores while combing hairs. 5. Fungal / Yeast scalp infection. Example Lipophilic and Malassezia fungus. 6. Undiagnosed and Scratched scalp wounds. These micro scalp wounds increase the risk of further infection to healthy skin and can damage hair follicles. 7. Oily scalp skin with excess sticky sebum. 8. Dandruff / Flaking of scalp skin due to microorganism called Pityrosporum Ovale. 10. Lack of regular sound sleep and proper basic hygiene. e.g not washing hairs regularly. 11. Sudden mental trauma, routine stress and depression attacks. A weekly (e.g say on every Sunday morning before bath.) application of concentrated Lemon Juice on entire scalp for atleast 30 minutes (causes mild burning sensation but is easy to tolerate) followed by a rinse with warm Neem water. For adding shine and luster to your hairs you can apply either Shikakai (Acacia concinna) a natural hair conditioner or Raw Egg White a protein dense natural conditioner (con: strong odour). While sleeping (on alternate nights) apply Jaborandi (Pilocarpus Microphyllus) Hair oil (with atleast 10% of pure Jaborandi extract). The next night apply Sweet Almond Hair Oil for scalp nourishment. e.g On Monday night say you apply Jaborandi hair oil and on Tuesday night you apply Sweet Almond Hair Oil then again on Wednesday night you apply Jaborandi Hair Oil and on Friday you apply sweet almond oil, so on. 'Ascorbic acid' from Lemon Juice and alkaloid 'Pilocarpine' found in Jaborandi Hair oil are two very powerful natural scalp cleanser and Vitalizer. Sweet almond oil provides essential nutrients to healthy cleansed scalp. Sweet Almond Oil is easily absorbed by scalp without leaving any annoying residue. This method keeps scalp very healthy, moist and promotes hair growth. I just Exposed!!! A "MILLION DOLLAR SECRET" most Pharma / Shampoo producing Companies don't want you to know. After treating your scalp conditions follow Sapta Kriya and Balayam again. This time you won't be disappointed. Recommended Brands: SBL Jaborandi Hair Oil - A 100% Pure Jaborandi Hair oil with 10% pure Jaborandi extract. Hamdard's Rogan Badam Shirin - A 100% Pure Sweet Almond Oil extracted from a special type of high quality almond called 'Maghz Badam'. I'm extremely happy to announce that one of my readers got benefited by this article. Her name is Cindy Gredovich, she is a Slovenian woman. 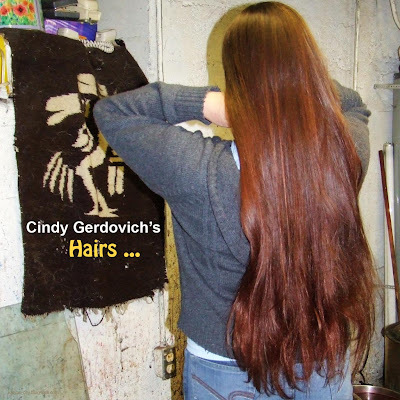 Today 'Cindy Gerdovich' a 28 years old, married woman from Slovenia emailed me her recent hair photos. In this email she said, "My long and strong hairs are a result of Balayam. I'm finally convinced that great nail rubbing yoga works". To know more about Cindy, please read her comments. Share and spread your divine knowledge with humanity, don't hide it for stupid, foolish and evil greeds. Lets Love, Respect and Protect the glory of Mother Nature and trust her precious creations. Believe in power of natural healing and divine ancient wisdom of our scholarly ancestors. Wishing you all a healthy, prosperous and beautiful life. Congratulations to Cindy and Thanks to all. Revised On: 4th August 2010 IST. I repeat. "I'm not a Doctor" else "A former patient who once suffered from multiple hair problems". Link - Balayam Ancient Fingernails Rubbing Exercise Reverse Baldness. This is the only article on the internet that speaks of ancient Sapta Kriya and not just Balayam. Sapta Kriya and yogas like Balayam are inseparable parts of actual treatment as mentioned in vedic literatures. No yoga is complete without spata kriya and guru's blessing. So if you're praticing yoga without spata kriya then you're wasting your energy and time, this is even not in rhythm with nature's laws, sounds strange but it is very true as per ancient india texts. Spata Kriya and yogas like Pranayam, Shirshasana and Balayam must be practiced together along with balanced diet and a satisfied night sleep (not day sleep). This helps body to gain maximum natural healing, specially hairs and vision are benefited. It is known to work even on a declining agile body of a old person. Recently discovered stone carvings of vedic era has a special mention of Kings and Queens practicing Sapta Kriya and yogas like Balayam to maintain their youth and natural beauty. One of these carvings even has a brief story of beautiful Queen Devayani inscribed on it. Devayani was a sincere devotee of Dhanvantari. Pleased by her sincere devotion Dhanvantari blessed her with trisutras of yovannas (3 Secret Formula of Youth) and also gifted her a Tulsi and a Neem plant. Dhanvantari (God of Ancient India Ayurveda and World's Oldest Surgeon) ordered her to pray rising sun only from top of a mountain, cut green grass from fields and feed her cattles, take morning bath in palace river and when she gets tired asked her to rub her nails. He instructed her to eat fresh fruits from palace's orchid in which there was special mention of Amla (Indian Gooseberry) and also told her to smell beautiful flowers. If we try to deduce above instructions scientifically we will see that Dhanvantari asked Queen Devayani to indirectly practice Spata Kriya, Balayam and Aroma Therapy. According to wise sages, Spata Kriya is followed by all living beings including birds and animals. Nocturnal animals like bats, some snakes, etc follow Netra kirya which is an opposite of Sapta Kriya but suitable for beings who are naturally active at night. It is a universal law of nature that Sapta kriya must be followed by beings who naturally active during day. Humans are not nocturnal in nature yet they follow Netra Kriya and challenge nature's rules. Today's modern human beings are more immune to various illness because they don't follow this simple universal law of nature. Even today's Modern medical science don't give special importance to Ayurveda and teachings of God Dhanvantari. It is Sad that modern science looks towards Ayurveda from more religious and not scientific point of view. This discrimination is even visible in government hospitals where an MBBS doctor is given class one grade while a doctor with BAMS degree gets second grade pay scale. This is happening in India from where Ayurveda originated. Today's modern medical and pharma industries don't want people to believe in importance of Sapta Kriya and powerful yogas like Balayam and Pranayam. I'm not quite surprised to see many people brain washed to not believe in power of Sapta Kriya and Balayam. Dear Gaurav Akrani, I'm very pleased you highlighted importance of Spata Kirya in above article. I'm also quite suprised, how you managed to write this though you're not a doctor? Dr. V. Naidu, AVS, Kottakkal. hello gaurav akrani. i'm cindy gerdovich from slovenia. i'm 28 years old married female having two childern and a loving husband. luckily i found your educational article via google search. This is my comprehensive and positive reply regarding balayam. Balayam worked for me. a month ago i started practicing nail rubbing exercise with an optimistic thought and my strong inner belief. Today after 34 days i feel delighted to share my positive experience with you. now i practice this nail rubbing yoga almost daily for at least 70-80 mins. Luckly just after a month i got remarkable magical results. my hairfall stopped completely, today i see no fallen hairs on my pillow, in my comb, i enjoy cold shower even in winter. this change was made all possible without any pills and special lotions. thanks to my inner bliss, respect towards nature, trust in indian yoga and strict disciplined life. my special message to beloved patients and specially all women who're struggling with hair problems...read my following message...it will change your life. 1. have your blood and body tested to identify a hidden illness like cancer, thyroid problems, hemoglobin deficiency, kidney and liver problems and to check deficiency of any vital nutrients. Consult your nearest government sponsored hospital to get your latest free health report. 2. exercise daily (walking, yoga, running, playing outdoor games) and follow seven golden nature's rules which is also called 'sapta kriya' in sanskrit. principle of sapta kriya and daily regular early morning exercise will help you improve heart's stamina, evoke mild sweating or perspiration and increase blood flow in the body. Perspiration helps you remove naturally, dirt and other toxins (via sweat) from your skin. this even helps our scalp to open blockages and cleanse itself naturally. increased blood flow helps essential nutrients to reach hair roots and promote natural hair growth. A combination of seven natural golden rules and nail rubbing even fight DHT, again naturally. 3. avoid excessive stress and always have a positive attitute towards life. plus belive in your power of imagination. While doing balayam and following sapta kriya i always kept imagining that "I cured my hairfall". everyday i used to visualize myself having beautiful, long blonde hairs. This power of imagination worked in my case. i've included following organic superfoods in my daily diet. 1.eat boiled egg whites. egg white is world's only most purest form of protein known to mankind. It is natural, purest source of protein, easy to digest, easy to absorb, and far better in quality when compared to soya and whey protein. Avoid consuming artificial protein powder. Hairs are made of a type of protien called keratin. egg white helps us avoid protein deficiency, supply us with higest quality of natural proteins, thus give us better keratin infact better hairs. just to remind you, protein in egg white is taken as standard while measuring proteins in other foods. 2.add a teaspoon or half of pure sweet almond oil to your salad. sweet almond oil is again natural, not only it cures iron deficiency or anemia but also nourish hairs and make their roots strong enough to resist abnormal hairfalls. Sweet almond oil act as a nutri-rich fertilizer for scalp and helps regrow hairs (again naturally). almond oil can be safely used both internally and externally. for internal consmption add one fourth teaspoon of organic turmeric powder and sweet almond oil to warm milk. drink this golden milk just before going to bed. Just before sleep, also don't forget to massage little sweet almond oil on your scalp for few minutes. this oil when applied daily even cures dandraff. 3.Drink green tea with honey (If you're diabetic avoid honey). Avoid adding sugar cubes and milk to green tea. Artificial sugar is a sweet poison and when you add milk to green tea its medicinal properties are destroyed. 4. Also add other hair quality promoting superfoods like Salmon(Omega 3 rich), homemade fresh Yoghurt (probiotics rich), dry fruits, Murunga or Kakadu plum (higest known source of vitamin c), also try indian gooseberry, papaya, carrots, spinach, oranges and other fresh juicy fruits. 3.you can also apply sweet almond hair oil. gaurav, recommends 'badam shirin oil'. but it is not available in my country so i use my local brand. Rogaine (Minoxidil), Propecia (finasteride), toxic anti-fungal anti-dandraff chemical shampoos with active agents like ketoconazole, selenium sulfide and ciclopirox. i also don't recommend surgical procedures like hair transplants which are extremely costly, painful, takes time to recover and needs medication. plz try combination of sapta kirya and yogas like balayam. trust me no matter what is your gender or age you'll cure yourself and simple again. my dear indian friend gaurav akrani! thank you very for writing and sharing your experience in extremely useful health article. i also thank dr. naidu for sharing story of queen devayani. you both shared your wisdom with the world, so did i. A self learned person who saved my hairs and body without falling prey to any physical, emotional and economic tortures. A simple woman who trusted her research, wisdom, inner bliss, god, and healing power of mother nature. I am returning here quite a few times to see any new comments and I am really excited about you Cindy with a great results so far. Anyway guys, I was doing scalp massage and balayam for quite of time, but I think I was doing it poorly as I didn't apply almost any pressure while rubbing nails, also was doing it without any emotions. Just like a robot. Wasn't doing pranayam as well, didn't apply any oil to the scalp and had super-bad sleep as was waking up at 1-4PM. So you might understand why balayam didn't help me that much. Now everything is a bit different, just still got a poor sleeping regime(trying to change it at the moment), as I started doing balayam more effectively, week or so ago, and so far I don't feel a headache anymore, which I had for around 6 months. Though I have few questions: how often do you wash your hair? I am now trying to loose some weight so I do sports and sweat a lot and that's why I am washing my hair around 6 times a week. Isn't this too much, should I always use shampoo for washing my hair? And one question which concerns me a lot. Does balayam reverse baldness or just stops hair-loss by making your small and very weak hair way stronger and thicker? I fully agree with point number six of Sapta Kriya that every human being must have a good night sleep of 7 to 8 hours. The best healthy time to sleep at night is between 10 am to morning 5 or 6 am. Sticking to this fixed sleep schedule is beneficial to reduce stress, feel fresh and maintain good natural health. During 11:00 - 2:00 a.m body undergoes in a natural process of rejuvenation and starts repairing damaged body cells. During this period even hair follicles gets naturally treated and cleansed. Hair problems are mostly seen in those people who don't sleep during this sensitive repair zone of human body and disturb their biological clock. So to save your hairs please always sleep during this time zone. Always sleep in complete darkness with all lights switched off. In darkness Serotonin converts to Melatonin. During night sleep presence of light hinders the production of important hormone called Melatonin. Thank you Spata Kriya. I'm practicing Spata Kriya and Balayam for past two months my blood pressure is now normal, vision is good and I'm seeing small tiny baby hairs on my scalp. This is my confirmation that Balayam Works! but sapta kriya helps you propel its effect. Beloved Gaurav! Son you changed my life. My blessings to you and your family. hello gaurav, i'm cindy. remember me? i'm the same person from slovenia who commented on this article page four months ago. i contributed few hair tips. for five months i regularly practiced balayam yoga and sapta kriya(seven golden rules). now i'm finally convinced that great nail rubbing yoga works for me. my hairs are now longer and stronger than ever before. my hair fall stopped completely. my blood report is also normal. during this period i also enjoyed juice of parsley leaves. parsley is my only trusted secret for kidney detox. i think kidney detox is also necessary for strong hairs and healthy skin. i'm sending you my current hair photo to kalyancitylife@gmail.com. i kindly request you to add this photo to your article so that people can see result of nail rubbing and sapta kriya. do reply to my email-id if you update this article with my picture. i regularly practiced nail rubbing and sapta kriya for five months. cindy gerdovich. age 28. female. slovenia. Congratulations to you. I have updated this article with a brief introduction of your success. Madam! Thank you very much for sharing your photo. Please check your email for my personal reply. Sir! Thank you for sharing your experiences with us. Congratulations to you. Hi, I am under tremendous stress due to my hair is getting thinner and thinner. But based on comments from Mr Johnson and Ms Cindy, hope will motivate and gives the confidence. Guys, please keep this thread active. Thank you. Welcome to our thread. Please don't take any tension as what you are facing now is something others have faced earlier. First have your blood tested if everything seems ok then start practicing Sapta Kriya and Yoga Asanas like Balayam and Pranayam. Also have a routine good night sleep of 8 hours and get physically active. For additional guidance reply here. Thanks for your immediate response. For your request that I should get my blood tested, yes i made full medical check up 2-3 months ago and was fine. About me, I have MPB as my father and grandfather is bald. I am generally active as i play sports and jogging and going to gym once in a while. I have been doing balayam (no sapta kriya) for the past 6 months but my shedding did not stop, but gets worst. Last time I am able to cover my bald areas especially temple with my frontal hairs but slowly it gets tougher to cover. I smoke occasionally. So basically that is about me. Now in the past 3 days I am trying to practise sapta kriya. Sleep at 10 or 11pm, wake up at 5 or 530pm, doing pranayam (anurom vilom & kapalbathi) followed by Balayam. I can get fresh milk and turmeric powder but I couldnt find Sweet Almond Oil. I tried to purchase Rogan Badam Syirin online but the official website doesn't sell online. And I do not trust other website as some of it looks quite suspicious. 1)Should I rub my 1 at a time or all 4 sine i feel more tingling sensation when i rub 4 nails at one go? 2)At night, can I just take apples or other fruits instead of rice+chicken,etc? 3)Where can I buy the Pure Sweet Almond Oil as i have only seen mixture of this oil with coconut oil & some scents. 4)Can I replace almond oil with pure virgin coconut oil or Virgin olive oil? Thanks again Gaurav for your help. Your blood report is normal as expected. You said you're a habitual smoker. This is where problem start. Smoking affect respiration so please quit this filthy habit. Smoking hinder the benefits of Sapta Kriya. You've a DHT problem like I had earlier. Search DHT on Google to learn more about it. If you're doing Balayam and experiencing some hair fall then this is normal. Don't worry, you're going through shedding phase. New hairs will come only when weak and damaged hairs are lost. The beauty of Balayam is that it even works on genetic baldness and alopecia so don't worry on this issue anymore. Simply trust Balayam. You said you're not able to find "Rogan Badam Oil". Don't worry, check your nearest medical store and ask for other reputed brand. I won't recommend you to buy this stuff online. 1. Rub fingernails the way you feel comfortable. Please see Balayam video in this article to find the right way to do Balayam. 2. I would prefer light dinner with curd. In your beverages list, please replace coke/Tea with milk i.e Chai/Coffee with Herbal Green Tea. 3-4 cups of Green Tea per day is good. Green tea is important for you since it is known to neutralize DHT naturally. 3. You can buy "Sweet Almond oil" from any local pharmacy or grocery store. Don't buy it on the internet. Don't buy scented or mixed oil buy only 100% Pure Sweet Almond Oil. 4. Don't replace Sweet Almond Oil with Olive Oil. I'm not sure but I read somewhere that olive oil is not good for heart. Namaste Gaurav, very good review of Balayam. I'm Vinay from Kolhapur. I practice Balayam everyday without fail. I started loosing my hairs at young age of 19. I'm still not bald because some yoga guru who is also a friend of my father instructed me to practice fingernails rubbing exercise. He also told me to drink Haldi Wala Dudh दुध or "Golden Milk" while sleeping at night. Luckily, I took his instructions seriously and started doing nail rubbing since then. Now my hair fall have stopped completely and I feel my hairs are much better and stronger than earlier. People who are making fun of this life giving yoga don't deserve to get treated. Let them live with Propecia and develop a woman's breast on their body plus suffer from other sexual disorders. Why they don't make fun of these dangerous drugs? I think stupidity is ignorance to divine knowledge. My uncle is a doctor. He advised me to stay away from Propecia and Rogaine. He says, "Powerful yogas like "Nakhancha Vyayam", if publicized globally, may close business of all Trichologists. The entire hair industry will collapse if people are educated properly". People are still waiting for some baldness breakthrough. Luckily, it was already made many years ago in India. Sadly people are still ignorant to this remarkable discovery. In India, Balayam have many other names. In Marathi we call it "Nakhancha Vyayam". Whatever may be the name the core concept remains 100% same. Once again thank you for creating a wonderful blog full of comprehensive information. Vinay Bala Jadhav, Age 20, Male, Kolhapur. I have been doing Balayam for about 3 and a half months. I'm 21 years old and not balding, but I have always had very thin hair and my father was bald, so I started doing Balayam as a response to stress-related (and probably genetic) hair thinning/shedding over the last year or so. There is no MPB on my mother's side as far as I know, and I am of mixed ethnicity (part Eastern-European and part Central Asian). I'm going thru what I think is the shedding period. I'm trying to follow Sapta Kriya but my body is not used to it yet (usually I oversleep until about 10 am). I am gradually training myself to sleep before 11pm, so hopefully I'll be following Sapta Kriya within a month or so. I am also drinking milk with turmeric before bedtime (I haven't had the chance to buy Sweet Almond Oil yet, but I plan on it. I'm going through (what I think is) an initial shedding period. My hair has always been quite thin, and I'm assuming that the hair I'm losing is weak, thin hair that needs to be replaced thru Balayam treatment. I'm hoping that the thin hairs I'm losing are going to be replaced by stronger ones, and that I'm not just having accelerated hair loss. In the US right now it is transitioning from Spring to Summer, so that seasonal shift may also affect the hair growth cycle. A lot of my friends and family are experiencing hair shedding as well, so I'm less worried than I would be otherwise. How long does the shedding typically last when you start Balayam? Is it possible to "overdose" on Balayam? Should it be done in one/two sittings, or all throughout the day whenever we have free time? Is there any time of day that makes it more effective? Are there any foods/drinks to avoid, or that make Balayam/sapta kriya less effective? Thanks very much for keeping this page alive! Appreciate your long explanation. Thanks. I am doing my level best to completely stop smoking. As per your instruction, I have completely stopped taking white sugars, morning i will just take bread and warm water, in the office 2-3 glasses of herbal tea as its readily available in the office. I would need to shop for green tea immediately. Any green tea brand is fine or do you have any recommendations? Today i went to 3 pharmacies around bangkok but they don't have any sweet almond oil. I even searched for saw palmetto oil but they do not have it, only pills. Is it ok to take saw palmetto in gel form? By the way i am currently working in Bangkok. I am from Malaysia. 2) Can I take saw palmetto gel to promote hair growth? I searched internet and found this brand. Aqua Oleum sweet almond oil. Its from UK and i can purchase it online via their official website. They have 100ml, 250ml, 500ml & 1000ml. I am planning to buy the 1000ml. Does almond oil have expiry date? 1. Shedding may vary from person to person and also depends on how severe your is hair condition. I experienced shedding for some 20-25 days. However, later it stopped suddenly. After next 2 months I started feeling my hairs stronger. Now I don't hesitate to comb my hair vigorously. 2. Yes you can overdose Balayam. The more you rub more stimulation in your scalp. But still one hour seems appropriate to me. Think! apart from Balayam you've many other things to do in your life. 3. Why one or two you can even do it in four sittings. If you're doing it in two sitting see to it that each sitting is of at least 30 minutes. on the other hand if your're planning to do in four sittings then each sitting must of 15 minutes each. For one sitting = 60 minutes. I personally do it in four sittings during my free time. Like while travelling, watching TV, listening music, before sleeping, etc. 4. Do Balayam anytime, its effectiveness will remain the same. When you're doing it (time) is not important else how well you're doing it (rubbing with seriousness) matters. Remember! Try putting some pressure while rubbing and do it regularly without fail. 5. First avoid all artificial sweeteners with ingredients like Aspartame. Aspartame is a US-FDA approved poison. Watch this Youtube Video to know more about Aspartame and its Dangers. Dangers of Artificial Sweeteners With Aspartame. Also avoid all junk foods, cold drinks like Coke, Pepsi, Cola and even energy drinks like Red Bull. Avoid beef, white flour and stale food preserved for many days in refrigerator. 6. Make a habit of eating fresh homemade foods. Include fruits, raw vegetables, honey, curd or yogurt, salads with sweet almond oil, fishes like salmon, roasted chicken and turkey, boiled egg whites and sweet potatoes, jeera flavored brown rice, chapatis (circular wheat bread) or bhakri (circular Jowar/Sorghum bread), raw red onions, chutney, etc. In your beverages list include coconut water, mixed fruits juice without sugar and salt, herbal green tea 3-4 cups, golden milk with sweet almond oil and turmeric. Important! Once in a week try drinking Parsley (Ajmoda) juice for safe and natural Kidney detox. 7. Avoid cooking in microwave oven as this destroys nutritional quality of food. Adapt traditional cooking methods like boiling and baking. Remember! You're What You Eat. I'm extremely sorry for replying late. I was on a tour at remote location near Chiplun. OK! Here is my response to your latest comment. I recommend you to go for brown bread and not white bread. Any good brand of Herbal Green Tea is good. I personally prefer Tetley and Lipton Green Tea. I'm quite wondering why Sweet Almond Oil is not available in Bangkok? Further even Saw Palmetto Hair Oil is not available. If you're not getting these just avoid them. When you go back to Malaysia then purchase it. Contact Hamdard and confirm whether they ship their products overseas or not. I've never used hair gels so can't say much on it. Yes sweet almond oil do have "Best before date" labeled on its pack. No sure but I think such oils have a shell life of 12-24 months. Extraction: Cold pressed and filtered without the use of solvents. Comments: At the beginning of the season, the oil has a slightly greenish hue but it changes to a rich golden brown as the season progresses. We have had difficulty obtaining genuinely cold pressed oil. The cold pressed quality is recognisable by its slightly thicker consistency and stronger taste. It is more costly than the chemically extracted product which is being blatantly sold as cold pressed. The chemical extraction process damages the natural fatty acids and significantly reduces the vitamin content. I hope the quality is equivalent to Hamdard's. I am waiting for them to ship to bangkok which may take several days. I hope i can find saw palmetto oil soon. Btw, the saw palmetto gel that i mentioned is actually not hair gel. It is gel in a capsule which to be taken orally. Gaurav, I have a question. Can I use almond oil as hair oil. Once i get the oil, i will massage to my scalp at night and wash it in the morning. And can I also use apply it during the day as a hair oil? Yes! Sweet Almond Oil can be used for both internal consumption and for external use. Yes! you can use it during day too. But your face may get oily during day if it is hot climate. my name is gaurav and i am suffering from hair loss problem for the past 7 years. my hair line is intact but the density in the middle is very less. their is no heriditery problem as my dad has superb black hairs now also. i am a pure veggi, eat soaked almonds, raisins, black pepper, fruits, milk, curd daily. i am doing gym for the past 5 years, do pranayam daily for 30 min and 1 hr on weekends. i am doing balayam for the past 40 days and experiencing hair loss(may be this is a shedding phase). how long will this take and i rub one finger most of the time like first with first for 15 min or middle with middle finger. i do this for an hour. can i expect positive results in near future as i want hair fall to stop first and then may be new hairs can grow. i follow all the gud practices like getting up early at 6 sleeping on time at 10:30. If you're already following good practices then don't worry just continue doing it. 1. Rub 4 fingers of one hand with 4 fingers of another hand. I was not comfortable to rub just a pair of fingers. 2. Do some meditation with all attention towards scalp and visualize you getting good hairs. The power of visualization helps too. Hope you are fine. Now I am doing sapta kriya in the morning, eating well, balayam for an hour, drink golden milk, apply sweet almond oil every night and wash in the morning, plus scalp exercise... wash my hair with cold water, etc. hope I can see positive results in a few weeks time. I would like to ask, in your article, you mentioned that all the 7 steps have cured you and your dad's hair problem. I believe since its MPB, your father might have experienced hair loss for a longer duration compared to yours. So my question is how serious was the MPB affected both you and your dad before start doing these 7 steps. Keep following and living in harmony with mother nature's rules. Once I experienced severe hair loss and thinning of hairs but was never bald. Now my hair loss stopped completely and hairs are much thicker than they were earlier. My father's bald patch was mildly visible in the center of the scalp. Now this bald patch is less visible and is healing slowly. First of all thanks for this thread. I already heard about you in youtube from Jimmy. Im 25years old male (Indian), Im experiencing heavy hairfall from the age of 17, now I'm almost bald (not completely though). I've been religious following balayam for last 12 months from 21/7/2009 but no result as of now, even my shedding hasn't stopped. I guess I don't have MPB as none of my relatives are bald, even my paternal grandfather is with full head of hair, he is at his 70's. It's only me who is an oddman in my family. I would like to reiterate that I was not aware of Sapta Kriya earlier and don't really know whether this had impacted on balayam result. I completely believe that balayam has something to do with the hair growth, as I still fell some tiny hairs in my scalp but however, they are not growing up fully. I'm planning to join Yoga class now, they informed me that i need to go for camp which is starting first week of september, before that I'm going to add all the activities listed in Sapta Kriya expect getting early in the morning, as I work till 12 (mid night). I also follow good diet, as I'm into bodybuilding and spend 4-5 days in the gym every week almost spending 60-80 mins every session. Therefore to conclude i don't have problem in diet, MPB but one thing DANDRUFF. I'm suffering with this problem for last 9 years atleast, this has ruined my hair I believe. I have done loads of treatment for this but nothing helped than just ruined my hair completely. Gaurav, I know its such a huge comment but you can feel the pain of me while writing this. Please do advice me, what should I do now inorder to regain my hair. P.S. : After a year of Balayam I've started adopting 4 fingers rubbing at the same time, to check whether this could help me. Many thanks for your help and concern. Does anyone here experience any obvious physical sensations that let you know that Balayam is working? When I do Balayam in the evening, I experience a slight increase in blood pressure in my scalp/forehead/upper eye area, and a little bit of itching in various spots on my scalp. It is like a slight throbbing feeling in the top of my head. These sensations have been somewhat consistent for the past 5 months that I have been doing Balayam. One some days I really feel the pressure in my scalp, on other days I don't. I find that the circulation effect of Balayam is signifiacntly increased when I do Pranayam breathing exercises (esp. Kapalbhati and Anulom-vilom with breath retention) for 15-20 minutes, each. I also do basic Ashtanga Yoga postures for 45-60 mins, 5-6 days a week. I am doing meditation for 30-45 mins a few times a week as well. Hopefully all of these things, combined with Balayam and less stress, will add some thickness to my hair. Hope that some of this information is useful! Gaurav (and everyone else), have you experienced any of the sensations that I have described above? Congratulations to you. The tingling sensations on your scalp is an indication that you've crossed 50% of your coming hair success. Just another 4-5 months to go for a complete healing. So keep doing it regularly. Read point no.5 of this article to try some new hair promoting yoga exercises. (Just updated). Now I'm also doing Vibhakat Hastpad Asana. This asana makes me feel more fresh and energetic. Can you write a brief review on Balayam? A personal request. Please read point number 8. of this recently updated article. You may be suffering from some undiagnosed scalp condition. Also get your blood checked. Gaurav Akrani, Thank you for your quick response to our queries, keeping this thread alive and updating this informative article. Ya this recently updated point 8 is very much for me, i suffer from scalp itches, pain and also severe dandruff. Thanks for pointing out this to me, just wondering what blood checkup should I undergo. What sort of tests are required in-order to find the right treatment. Many thanks in advance for your timely help. Gaurav -- I will write a review of Balayam after I pass the 6-month mark (the end of August). I highly recommend to use Aubrey Organics Men's Stock Biotin/Ginseng Shampoo, and Men's Stock Biotin/Ginseng Hair Repair (it's sort of a conditioner). These products are a little on the expensive side, but they seem to be nourishing my hair without stripping it of its nutrients, and are making my scalp feel much better. They are marketed as designed to help with thin hair and unhealthy scalps, and are completely herbal. I've been using them for a few weeks and my hair is in a completely different condition. It's definitely helping, as the crazy heat/humidity in the United States right now is aggravating my hair problems even more. Has anyone noticed any consistent connection between a particular pair of fingers with a particular area of the scalp? @ MarqueeMoon, It depends how long you are practicing (time) and how vigorously you are rubbing (pressure). I get sensation starting from my forehead then shifting to the center of my scalp and feels like ending behind my ears. Before stating Balayam start following Sapta Kriya and check condition of your scalp area. Hi Gourav, Thanx for your quick reply, ok, i will start sapta kriya and balayam, cud you please tell me what did you mean by checking condition of scalp, you want me to have it checked from a doctor or shuold i check myself things like dandruff, oily scalp condition, itching etc. Waiting for your reply. Yeah! If possible get your scalp diagnosed for a registered medical expert in your area. Hi gourav, Thanx for ur reply, M astudent livin in New Zealand, Here doctors r damn Expensive, But il try my best to get it checked. Consume Green Tea and Golden Milk daily and practice Balayam regularly (along with above hair promoting yogas) without fail. I think it will take at least a year to heal. Regularity is important for success. Trust mother nature. My blessings and good wishes are with you. Don't worry MPB is curable. It might be a good idea to cut your hair super short for the next year while you practice Balayam/sapta kriya/pranayam/etc. I believe that this lessens the tendency to over-obsess about the current state of your hair, and especially to lower your expectations about the initial stages of treatment, allowing you to put more attention and dedication to actually doing the practices. With diligent effort and encouragement from those of us who have been doing these practices for a while (especially Gaurav), you should just practice them with faith, and (MOST importantly!) regularity. Balayam and sapta kriya must be practiced religiously for a long time (6-7 months, as this blog suggests) in order for results to BEGIN, and continued after that point for the momentum of the cure to continue working on your body. It is a long and clumsy process which may cause you discouragement, so it is good, at least initially, to mentally prime yourself and establish faith in a process that takes a long time to bear fruit (but in the end it's worth it). So for those who advocate balayam… is it preferable to do it standing up or sitting down? How about laying down? Should the time spent on all fingers be equal? I would love some input on this? Thanks in advance. Sitting down works best for me. (It makes sense to not be moving the rest of your body too much so that the circulation can move up to your head). Doing a pair of fingers at a time seems to work best for me as well (not the sweeping method, although that works for other people too). Make sure to do kapalbhati pranayam (10-15 mins), anulom-vilom pranayam (10-15 mins), and shoulder stand (sarvangasana) for 3-5 minutes each morning. It all shouldn't take more than 25-35 minutes. Does Balayam work in cases of Skull Expansion?DHT and MPB are causes of hair loss but i read skull expansion also causes hair loss at the frontal region.Will hair regrow where hair has been lost due to skull expansion? Hi Gourav, M Navi from New zealand. m doing balayam with full dedication. m writing this post to tell you bout progress. m expecting some good results in 8-10 months. keep on posting Gourav, dont let this forum be statutory, so plz keep on sharing your valueable suggestions and experiences. lots of people have hope from balayam. Hi Gourav, How r u? M doing balayam from one and a half month now, i am experiecing heavy shedding nowadays. I just want to ask you that m i doing thru the shedding phase as i am doing balayam or this sheeding is due to my natural hair loss, is it possible to experience shedding phase after one and a half month of balayam? I also want to ask you (gourav) and marqueemoon that which method of balayam u guys using? is it all fingers togather or the other method shown in the video above? I am using the method shown above, usually with my middle fingers or index fingers. Are you also doing Pranayam and following Sapta Kriya? Tahnx a lot for your reply, M doing balayam regularly and m also taking golden milk nd do scalp massage with sweet almond oil, m also doing pranayam like anulom vilom etc. But becouse of my work timings here i cant follow sapt kirya properly. How long you been doing balayam? Are you following sapta kirya and prayanam? You have to do Kapalbhati Pranayam AND Anulom-Vilom back-to-back in the morning (10-15 minutes each). In my experience, you absolutely must put in a minimum effort daily if you are to have even the possibility of seeing results. Rub your nails with hard pressure. For 15 minutes at a time, whenever your hands are free. (It's not that time-consuming, once it becomes a habit). I think that if you force yourself to make time for Pranayam early in the morning, you will naturally develop the discipline to manage the rest of your time much better. Practices like Pranayam naturally fight against laziness. first of all extremely sorry for replyin late, was too busy because of christmas here. and it normaly takes 4am till i get to bed. So i hardly get time to sleep erly like 10pm or wake up early like 5-6am to get a good 8 hour nite sleep and to do early morning exercises respectively. I am doin balayam regularly and also massage my scalp with sweet almond oil and take golden milk aswell from last 3 months, but till today i have not seen any imrovement yet, and one thing i wana mention here is as i am massaging my scalp nowadays i can see small red pimples on me scalp and its itchy after like two weeks of massage its gone bt again now i have some pimples bt very less in number then before, it seems like i have dandruff problem aswell. I dont know wat shud i do to cure my heavy hair loss, i am doing balayam regularly with massage aswell. i request MM and Gourav to suggest me something best according to my work schedule, because m tired of being in this mental condition which everybody feels while they suffer heavy hair loss. There's no result of any kind after almost one year of constant exercises. Except of a problem with one nail. But I still believe and will do it anyway. Even if there would not be any results. Because it brings us a hope. Man! I'm really feeling sad for you and can't understand why it is not working for you. Are you following Sapta Kriya or not? May be western life style must be blamed. If it is not working I think you're surely missing some important part. In my case almost two years passed and my thin hairs are now much more thicker, darkers and stronger. So I don't use hair gels anymore. My Hairfall have also stopped completely. I've now started a new holistic treatment of eating neem leaves daily. Neem is a natural blood cleanser and keep your skin glowing. I will write my neem experiences about after few days. I'm soon going to visit Arya Vaidya Sala. There i'll consult ayurvedic doctors and gurus and try to find more info about hairs and related ailments. If i get some new info and useful tips I will surely share these with you guys. My good wishes and blessing are with you all. I'll revise and re-write this article once again in my free time. Thank you for your response and warm words. Probably western life style must be blamed. Or my genes (more obvious). I'm trying to follow Sapta Kriya as far as i could. I try to go to bed at 22-30. I do Shirshasana almost every morning. I also stand at my hands up side down. I can't find a turmeric though. Does it have any other name? We don't have it here in Siberia. So i can't make a golden milk. No Propecia, never. I quit Rogaine 3 years ago. And then there was an awful situation with my hair. Sweet Almond Oil. I'm not sure that here in Russia we have a good one, but i use it anyway. I've bought Power Grow Comb recently. (it uses laser and infrared LED lights to help stimulate scalp cells). I know it doesn't sound great, but i'll try it anyway. Extra massage. What else could i miss? Any ideas? And yes, i still hope. Dear Gaurav and anyone interested. Hi! I wanted to share my brief experience. I have just today found the technique of rubbing my fingers together for hair growth. I have a disorder called trichotillomania. This means I pull my hair out. Its been impossible for me to stop. It actually feels very good if I pull it, and I feel awful when I resist. It have been pulling it out for 29 years. The doctors only offer medication. I decided to try your technique because I have a very large bald patch. The hair their never gets long. I cannot style my hair except in an upknot to hide the bald patch. Well, I tried your technique and it feels wonderful. My scalp was itching, forcing me to want to pull my hair. But when I did the finger rubbing, it stopped bothering me. I was able to resist. This is magnificent. Also, it felt so good emotionally. It feels really good and satisfying to rub my nails. Better than when I pull my hair. This relief is something that I have NEVER experienced before. I can easily see myself doing this and never touching a strand of my hair again. I think you have something really wonderful here. I feel so blessed. I have only found relief in lye hair relaxers in the past. Hey buddy! Please never blame your genes again. Better blame your lifestyle, some bad cultural habits, lack of awareness and indiscipline in life. I guess you too are facing same old DHT problem. 1. If you do gym or any other vigorous sport then, please avoid consuming protein supplements or milk shakes or bars. Furthermore, stay away from Creatine Monohydrate and never ever think of injecting steroids. These artificial substances are good for nothing. They trigger hormonal imbalance in a healthy human body. Testosterone levels, especially in a male body are highly at risk. Consuming these substances mean a sure invitation to the DHT problem. 2. Avoid frequent or excessive matuurbaation (purposely spelled wrong) and ejaaaculaation (purposely spelled wrong). This habit of excessive stimulation results in forming more byproducts of Testosterone called DHT. DHT is No.1 cause for male pattern bladness i.e. MPB. If you control your libiidoo (purposely spelled wrong) you'll also control your DHT. Thus low DHT equals less hair problems. 3. One bad habit of a russian culture is heavy consumption of alcohol. madyasaara (Sanskrit word for alcohol) Prashan (Sanskrit word for consumption) is heavily criticized in KeshaaSutra (Keshaa means 'hair' and Sutra means 'formula'. Keshaasutra is ancient india's orally preserved collection of vedic sutras delivered by Rishis (wise sages) to their Shishyaas (students). Rishi Shantalacharya (7223 B.C.E) formulated KeshaaSutra. He was world's first ancient trichologist who established direct relationship between alcohol and hairloss. He writes in Keshaasutra how madyasaara makes a being bhramiTa (Sanskrit word for confusion which results in a temporal insanity). Shantalacharya says in KeshaaSutra, "Prashita madyasaara nara jaivee dhatu, zivanu, va budhhi vinashkaa. Nirmulitaa sharirama jeevitaa kriya. Parinaamaati vidrohaa keshamma kendranaadi vinashkaa. Tothi nara rakta vishaa rohit pizaacii pariNaama. DyanaShunya kezaghna napuMsaka mrutyusa nimantraNa." English translation of his divine words says, "Drinking alcohol deprives a healthy man from his life giving microorganisms and minerals. Alcohol halts body's essential systems and life cycles which later results in destruction of hairs and central nervous system. Blood slowly turns into poison and man starts looking like a red devil. Lack of this knowledge transforms a man into bald and impotent being who invited his sure death." Today modern science have reestablised his theory of alcohol hair loss. It is now known that alcohol elevates estrogen levels and reduces the levels of zinc, vitamins and folic acid in the body. This results in hairloss. So please stop consuming alcohol. 4. Avoid multi-vitamin pills. Only take if a deficiency of some essential nutrient is identified. Excessive overload of vitamins (i.e hypervitaminosis) is extermely harmful for organs, skin and hairs. 5. You can buy Turmeric roots (Curcuma longa) from any indian grocery store in russia. Take help of indian immigrants in Russia. 7. If you have any scalp related ailments consuming neem leaves (caution: very bitter in taste) can help a lot. 9. Exercise and Green Tea are best natural ways to fight DHT without any harmful side-effects. 10. I don't recommend you using laser and led lights on your scalp. Instead I insist on bathing your body and hairs in early morning sunlight. 11. Avoid wearing sport cap or hat for long durations. Due to this hairs and scalp don't get enough oxygen. 12. Wash hairs daily as sebum, sweat, dust, blocks scalp's pores and making them oxygen deprived and suffocated. 13. Avoid drying your hairs with hot hair electric dryers. Let your hairs dry naturally. 14. Shave your head once a year (very good pratice). While your barbar is shaving your head ask him / her to slowly and gently remove thick resin like layer (formed due to dead skin) from your scalp. This is a good practice for cleaning your scalp and growing new thicker hairs. 15. I don't recommend colouring of hairs. Be happy with your natural hair colour and save them from harsh chemicals. 16. Continue practising Pranayam and Balayam strictly as per natural principles of Sapta kriya. I hope you won't be disappointed if you better re-check and find out which important step you're missing. Your sincere hard work will surely transform you after few months. I'm living example of this. Welcome and Congrats to Gail. You are right. Propecia ruin people's life. Its better to stay bald than taking propecia pills. Now I follow you advices more completely. Yes I’m facing same old DHT problem. I have never thought of this in this way. I thought it’s like an act of purification. Not so often of course. But now I understand the thought. Will control it. 3. “One bad habit of a russian culture is heavy consumption of alcohol” – actually this is a stereotype. I don’t know who create this image, but it’s surely not more than in Europe or USA. As for me I don’t drink nothing (as my parents as well), except of one bottle a week of so called “alive beer”. And purposely did it, because they say it’s good for health. It contains barm or brewers yeast (don’t know which name is right for it). But if you say even this is not good, I quit. So I don’t drink nothing after your post (3 weeks already). First of all alcohol is bad for liver, and this is very important. 4. “Avoid multi-vitamin pills.” Ok, I also quit this. 5. I have found Turmeric, so now I drink Golden Milk every evening before going to bed. I didn’t drink milk before, but now I like it. 6. “Avoid hot water, hard water for washing hairs (use warm soft water for washing your hairs. )” – ok, I do. 7. “If you have any scalp related ailments consuming neem leaves (caution: very bitter in taste) can help a lot.” – can’t find it :( does it have an other name? I use now birch tar though. 9. “Exercise and Green Tea are best natural ways to fight DHT without any harmful side-effects.” – yes, i consume these. 10. “I don't recommend you using laser and led lights on your scalp. Instead I insist on bathing your body and hairs in early morning sunlight. “ – will try. 11. “Avoid wearing sport cap or hat for long durations. Due to this hairs and scalp don't get enough oxygen.” – can’t stop using it outside :( this is our society and culture are to blame..
12. “Wash hairs daily as sebum, sweat, dust, blocks scalp's pores and making them oxygen deprived and suffocated.” – yes, this is definitely right. 13. “Avoid drying your hairs with hot hair electric dryers. Let your hairs dry naturally.” – yes, right. 14. “Shave your head once a year (very good pratice).” – unfortunately can’t allow this to myself now :( should change my job first. 15. “I don't recommend colouring of hairs.” – but how about henna and “black hair dye” (Basma)? i hope you know what I mean, it’s a natural substance to strengthening hair and also colours it. 16. “Continue practising Pranayam and Balayam strictly as per natural principles of Sapta kriya.” – yes, I will for sure. Dear Gaurav, thank you once again for the words of truth. Scientific name of Indian Neem Tree is 'Azadirachta indica'. I can't say whether Neem plant can be grown and sustain cold climate of Siberia (in Russia) or not? However, you may get Neem at the same place from where you bought Turmeric. You thanked me, so i say, you're most welcomed. God bless you a good health. Hello. Im performing balayam nails exercise from almost a year now. im 18 and never suffered from hair loss problems, all im doing this for is to mantain my hair in good conditions since my dad is bald. i want to ask some things: do balayam work on the frontal part of the head? or only on the scalp? , can it alone cure baldness or do I need to perform sapta kriya? what exactly do you mean with sapta kriya? Thanks for the information. Is that the only sutra from Shantalacharya in KeshaaSutra or are there anyother. I couldn't find SBL Jaborandi hair oil in nearby ayurvedic shops. Is there any online stores that sell this product? Any kind of information on this will really help me and others too. Find your nearest dealer by visit this webpage of SBL. I bought SBL Jaborandi hair oil and also started using meera herbal hair wash powder. since then, my scalp is itching and burning, and its dry, hair is falling out. There's another product from SBL called scalptone, i started using that. Is this causing any problem. Should i stop it(i guess i should). which is the best shampoo, previously i used shikakai poweder from another vendor and now switched to meera. any recommendations. i need to stop this itching and burning, dry scalp and also hair fall out. If sbl products are causing allergies to you and not working for your body type then please stop using it. I would recommend to get your scalp diagnosed from an authentic Ayurvedic doctor or a trichologist. Itching might be due to dandruff or some other scalp infection. It is always wiser to get your condition diagnosed from a medical expert. Another tip. Stop sharing comb with family members. It is always better to use you own personal comb so as to avoid possible scalp infections. Also, please wash you personal comb at least once in a week with a some good antiseptic solution. Hey buddy! Do consult a doctor as soon as possible. Take care and my blessing to you. Hi, I have been practicing the bail rubbing exercise everyday for the past six months. I go to a yoga class regularly five days a week and am very healthy and active. Since the last month I hve noticed that my scalp has become excessively oily, I wash regulary with a good clarifying shampoo but it still get oily in about a day or two, my hair is clean there is no product build up or anything just very oily. My routine is the same, very healthy. I have also noticed that doin the nail rubbing exercise increases the oils in my scalp. My hair is in better condition and hairfall in very less now. Could the oily scalp be related to the nail rubbing? Please reply back and let me know if more oils are produced by your scalp healthy or not? Thank you very much! Hey Gaurav, I stumbled on this post about some time back. I have been doing balayam since 6th dec 2010 alongwith some other exercises. At the beginning of june, i noticed very small brown hair growing on my bald region(i am bald at my front). Now after about two months, the hair have grown to the extent that they are noticeable a little. What should i do now? My father is suggesting to shave the bald region to grow the hairs faster. But i think its still early. I am doing the exercises more than ever now. But please suggest whether i should shave my head or wait. And is there anything more i can do to stimulate it? Its awfully slow, although i am determined more than ever. Please reply soon. Thanks.Hey Gaurav, I stumbled on this post about some time back. I have been doing balayam since 6th dec 2010 alongwith some other exercises. What should i do now? My father is suggesting to shave the bald region to grow the hairs faster. But i think its still early. I am doing the exercises more than ever now. But please suggest whether i should shave my head or wait. And is there anything more i can do to stimulate it? Its awfully slow, although i am determined more than ever. Please reply soon. Thanks. But my front area of my hair is continuously loosing and sheddding hair without any new hair growth, please help me out. If your scalp is too oily and sticky, then follow this safe natural treatment once or twice a week just before going to bed. 1. Take 1/2 cup of fresh home-made plain whole yogurt in a Non-Reactive bowl. Yogurt is called 'Dahi' in Hindi and Marathi language. 2. Then, add 4-5 teaspoons of fresh concentrated lemon juice to the yogurt. For this, squeeze out fresh lemon juice from one or two lemons. If you have a sensitive scalp just add juice of only one lemon (1-2 teaspoons approx.). However, if you can tolerate a little mild burning sensation on your scalp then add juice of two lemons (4-5 teaspoons approx.). Remember! Adding more lemon juice increases the concentration of Citric Acid in your mix. The amount of citric acid is also proportional to the intensity of burning sensation experienced on a scalp. My recommendation says, juice from two lemons is sufficient. 3. Now stir well the mix of lemon juice and yogurt with a teaspoon. Later, keep bowl of this paste in a refrigerator for few minutes (10-15 minutes approx.). Better verify that you haven't applied any cosmetics like hair gels, oil, spray, shampoo, conditioner, dye, etc., on your hair. Also cross-check that your scalp and hair is dry and in a natural state without any residue coating left on them. This caution is very important to avoid any adverse reaction, if any, of citric acid with chemicals found in above cosmetics. If you have any of those (cosmetics' residues) on your head then first better rinse them off completely with cold water followed by letting your hair and scalp dry naturally. Also wash your hands and dry them too before you move to next step (fourth step). 4. Get back the bowl from your refrigerator. The mix would be now little cold and thick. Next, apply it gently on your hair with fingers as if you're combing. Let the paste sit on your head for next 30 minutes so as to heal your scalp and hair. Even though the cold mix / paste would be thick enough, take care that it dosen't drip on your eyebrows and accidently manage to enter in your eyes. If it does enter, immediately wash your eyes with cold water. After 10-15 minutes of application, you'll slowly start experiencing a mild burning sensation on your scalp for next few minutes. Try to tolerate this mild burning sensation. If you find it is too difficult for you to tolerate the burn then sprinkle few drop of cold water on your head. Why do this? Because cold water will quickly dilute citric acid concentration and also the intensity of burning will come down. Once you feel relieved, wait for next 15-20 minutes till your burning completely slows down. Above steps will take around 30-40 minutes approximately. 5. After 30-40 minutes, now wash you hair only with cold water. Repeat washing of hair for 2-3 times. Caution! At this stage (fifth step), don't use hot water nor any soap, shampoo, conditioner to rinse your hairs. 6. After washing your hairs, use a hair drying towel. Avoid blowing hot air on your hair using a dryer. 7. Once your hair gets dry, while touching you'll feel them quite thicker, polished and shiner from root to tip. You'll also notice that your scalp's skin is now exfoliated, cleansed and healed. When you go to bed you may still feel a very mild tingling sensation on your scalp. Don't worry by this and nothing is wrong with your scalp. This sometimes happens because very little amount of citric acid and yogurt is still present in opened pores of your scalp. So without any further worries take a good night sleep for next 7-8 hours. After you go asleep, throughout the whole night, this little amount of citric acid and yogurt caged inside your opened pores will continue cleansing for next few hours until it lose its potency. 8. In the morning you're once again free to use your favourite herbal and pH-balanced shampoo to wash off the newly open pores on you exfoliated, cleansed and healed scalp. Concentrated Citric acid found in lemon juice is very potent (holistic, powerful and effective in long terms), safe (no negative effects are noticed) and natural (free of toxic chemicals) home-made remedy for most scalp related ailments and problems. In Ayurveda it is well-known to treat conditions like dandruff (flaking of scalp's skin), oiliness of scalp due to sweat, clogged dirt and sebum in pores, itching of scalp, red bumps or sores (pimples on scalp), lice infestation (pediculosis), fungal / yeast infection, Tinea capitis (i.e. Ringworm of the hair or scalp), scalp wounds occured due to vigorous combing resulting scratching and bleeding of scalp's skin. Yogurt moisturizes and soothes your hair and scalp. It also helps to avoid unnessary dryness and breakage of hair. It acts as a coolant when citric acid is doing its healing work on scalp. I perosnally give myself this lemon-yogurt treatment atleast once in a week. It is almost a year now and till date I haven't noticed any itching, oilness or flaking of my scalp. My sincere thanks to my Spiritual Guru and wise Vedic Scholar Shri. Vaidya (97 years old and still counting + healthy) for this holistic advice. My hearty gratitude to mother nature. she care about you with her maternal love. Yet! Your greed is her never ending story. So she pre-invented remedies with her magical tricks. Still! Why don't you feel her loving touch? She will exist for every coming day. Accept her reality and don't miss your chance. Listen her songs of spiritual lessons. Please! Never turn your back on mighty MOTHER NATURE." Every ailment is curable, but only if you embrace her holistic remedies. Continue what you're doing and don't lose your devotion and motivation. You said you've noticed small baby hair so let me first congratulate you. Buddy! You're on right track keep doing. To shave or not to shave should be your own decision and not others. At least in this case, don't embrace decisions made by other for you. If you're happy with your success then why not wait little more to see more positive results. You can also choose to do a solider cut instead cutting baby hairs that are motivating you to keep going. My dear brother, please remove inferiority complex you're nurturing in your mind. You're not the only person who is going through this ailment. Don't let your personality degrade and make you a social outcast. A happy psyche = a happy body. "I've a small problem and Yes! I will soon fix it with my earned wisdom and hard work." 2. Second thing, have some patience. Balayam is not a magic bullet else it is a slow, gentle and effective treatment. When you're rubbing your nails see to it that you maintain good amount of pressure on finger nails of both hands. I'm very sorry for delay in moderating your new comments. Due to some personal reasons, it is getting tough for me now-a-days to spare reasonable time for my blog and continue our meaningful conversation. Did I missed someone to convey my personal reply to? If so, please remind me by re-commenting your queries once again. This thread is still alive and please feel free to post your personal doubts on this page. I would try my level best to advice you better with right information on this subject. hey gaurav u havnt reply to my comment. Please excuse my lack of knowledge of hair styles, but i could not understand that what you were trying to elaborate in your last msg about 'solider' hair cut. I think you are going through a shedding phase in which weak and thin hairs fall off. This is quite normal so don't worry. Practicing Balayam regularly will give good results on your young body. Just search 'Soldier haircut' on Google's search and you will know what I want to say. hey gaurav, can u please explain me in detail about the shedding phase and it s duration. And what after that. Please let me know how to deal with hard water? Install a water softner in your bathroom. I've installed ZERO B Water Softenizer in my bathroom. ZERO B water softener is quite affordable and i'm very satisfied with its soft water quality. Shedding phase varies from person to person and also on your current hair condition. On an average may be few days to few weeks or sometimes even for a month. Does the temple hair and the hairline grow back? i even asked about the skull expansion.the forehead looks broad.guess coz the hairline recedes.so i would appreciate if you tell whether the hair at temples and the hairline regrows? !thank you. I observe pimples in my head. Whats the reason? Any idea? I can't guarantee anything because I'm not a GOD. But one thing I would like to say, is that, you will see good results, provided you practice sapta kriya and balayam regularly with sincere devotion. Buddy! I think you have scalp bumps. Plz! Don't burst them. Use lemon treatment with yogurt once in a week. Start eating RAW FOOD and do some moderate exercise daily. sir I ve been getting great results from balayam I practice it 3 times a day I had earliewr commented abt my left forehead (the 19 yr old ) . hey guys listen balayam is working for me . I started practicing Balayam recently about a month back. I practice by doing both the methods of nail rubbing mentioned above with very good pressure. However I still very normal after one hour of rubbing. I dont feel increased blood pressure or blood rushing to head. However, when I do shirshasana , I do feel increased bood rush to head. I want to know if something is wrong in my rubbing , what are the right indicators? I request you to share your experience. a) After how many days/months after you started practicing Balayam did it start working for you? b) Do you rub two fingers at a time or all the 4 fingers at a time? c) Do you feel any itching sensation while doing Balayam? If so, after how many days after starting did you feel it? d) Do you feel blood rush to your head while practicing Balayam? e) Do you follow all the method listed above by Gaurav? I think it would be great if you could share your experience. I request all others who are succesful to share their updates. If possible pls do it with photos. I started doing Balayam with sapta Kriya only a week back. I have taken pics from start and upload once I start noticing some changes. While rubbing put a balanced pressure on finger nails of both hands. Practice it in short intervals of 15 minutes each day (for four times) at any convenient time of your choice. I started doing Balayam around 20 days back..
at times I feel some sensation..different every time when I am doing it and sometimes just after I have done it..
One very SURPRISING thing which I think is happening is that earlier I had to shave in 1 week ..now that same growth of beard takes place in 3 days...THIS HAS ASTOUNDED ME..is this a good sign?Bad sign? eg I just shaved on Wednesday and here I am now on Friday and need another shave!! hey JM sounds u had the same prob as of mine!i too aint bald but have a receded hairline(half an inch i guess).the templer area and the hairline look oily/greasy(maybe i style the hair too much :P)i get small tiny pimlpes which break due to which i have a small black scars(not big ones so no big issue)but i would like to know did u regrew all of ur hairline :-O(am happy for you :D)so do help me!as in what exactly u did apart from balayam(oiling and shampooing thing) :-) Thanks! and 1 more thing ya..JM..do u do the balayam with 1-1 finger or 3-3 fingers,i mean nail of the index finger to index finger or all the three fingers together..lol am i sounding funny (-.o) its just that i want to know what exactly did u do! he he thanks! Thank you for sharing your experience. I will update on the progress after few days. hey jm...u say "the dirt is gone"..what do u mean by that..what dirt are u talking about? 1.are soybeans good for hair? 1. Any plant based food source like soyabean is always good for health. However, avoid overeating only one food. Add variety of nuts, lentils, beans to your diet to meet your protein requirement. 2. Currently I'm using, "SESA Hair Protein Shampoo." 3. I have used saw palmetto only as a topical application (twice a week). I prefer to ingest green tea twice a day (without milk or sugar) as my natural food to fight DHT and Hormones balancer. Also, moderate regular exercise, raw food diet, good 8 hour sleep, meditation, and other sapta kriya activities can add wonders to your health. Where can i get saw palmetto as topical application?can You please suggest the name/brand of the oil or lotion?! Saw Palmetto is an ingredient of Parachute Hair Therapy oil. many a times i get some sticky bulb like thing along with the hair..ususally from the temples..its at the root of the hair..and even at the hairline..can u plz tell about it.i feel some kind of acnelike thing(mostly close to hairline and temples)and when i try to rub/remove it..it comes along with hair..sometime very short thin hair! Congratulations JM for your current success. Your sincere 3 months devotion finally paid you a good health. Continue practicing nail rubbing for next few months (5 to 6 months more) to get expected results. Never give up this beautiful yoga. Try to manage some time for balayam everyday and make it a routine. Hair styling is not bad as far as you don't use harsh chemical products / cosmetics. Always read ingredients before you buy any hair product. For safety, try choosing original premium herbal products. Can you be more specific on other ailments. can u tell the blood test that needs to be done?what things need to be checked.i would appreciate the list of necessary things to be determined by the blood test. First of all, I'm very sorry for replying too late. Currently, I'm working at a remote location, and here the internet is almost inaccessible. For dark circles balanced diet with regular exercise helps a lot. My sister uses "Clarisonic Opal Sonic Infusion System" to maintain her eye area and she is very happy with it. To correct nose shape you may have to undergo a nose job. I think here a small surgery is the only solution. Yoga can't correct your nose shape. Do a simple blood test at your local pathology lab and collect your blood report. Blood test will help you know your current hemoglobin level, nutrition deficiency, if any, etc. 1. First Get your Scalp diagnosed. 2. Show doctor your blood report. If you want to preserve medicinal benefits of any tea (Green, Black, etc) then never add milk to it. Yes! Drink pure green tea only. Don't add milk or any milk powder to it. If you prefer to improve taste of green tea then try adding pure organic honey to it. Friend! This thread is still alive but sometimes my personal replies may not be instant. I apologize for this delay in advance. to further strength my scalp's health. By reading this post i have started balayam.I am doing Balayam from past 3 months but not feeling any of the positive result.Also in autumn my hair loss is very much and dandruff is growing like anything.Actually my scalp is very itchy & have alot of dandruff for which, only thing i can do is wash my hair with shampoo everyday.I started doing yoga/pranayam about an year ago which helped me for weight loss.I am following each of the practice mentioned in this blog but unfortunately doesn't working for me.I am doing all the things mentioned below. 2.Doing 1 Hr yoga after getting up including Pranayam,Verichan kriya,Tadasan,Vibhakat Hastpad Asana,shirasana. 3.Nail rubbing for more than 1 Hr. 4.taking goldan milk every night. 6.doing oil massage every night with mustard oil. 7.Eating raw food like carrot,egg, salad,grains,yogurt,fruits,veg juice(Bitter gourd) alot. 7.Applied lemon juice, yogurt mixture for 30 minutes every week but dandruff is still in same condition. Can you please suggest me that is there any loose end or am i missing something here?Also can you suggest how your practice to eat neem leaves helped you? I'm really shocked to imagine why you are an exception to this result oriented routine. Are you under any severe stress? Are you suffering from any mental trauma? Are there any problems in your relationship with family, colleagues, friends, etc? If everything is OK and nothing is working (which is very very rare) then please get your scalp diagnosed immediately from a wise medical professional. Consult a Dermatologist and also a Trichologist. Before consulting them better be ready with your latest blood report. If you current chores permits you to spend little more time, space and money then try consulting authentic Ayurveda's maestro and expert doctors of ARYA VAIDYA SALA, Kottakkal, which is in Malappuram District of Kerala. hi Gourav! very nice to c dis article finally...feeling relaxed, hope i'll get benefitted by ur valuable posts very soon..hv strtd doing it frm last 15 dayz n it's a completely new experience..thank u so much! Thanks for replying & your good wishes. I believe you picked a right nerve. I was under stress from past 2 months due to some personal problems for which i practiced meditation also. Now i feel much better.I guess i should get my scalp diagnose as condition of my scalp is becoming worst day-by-day because of dandruff. Nonetheless i will continue balayam & all practices because i do belive in yog & balayam. I will update you whatever will be the progress. I have been doing balayam since 6 months, my hair fall have reduced, but could not see and re growth. But today i have seen very minute small black hairs in the bald region, i dont know that they are new or the old hair, please tell me that what it could be, and what should i do now. I am Shivangi,and i have read this forum on 02/11/11 and started doing balayama since 03/11 however i have missed many days inbetween but yes i can say that my hair fall has been stopped at all....i am so happy to see it. but gaurav one thing which is depressing me that is gray hairs ...its increasing day ny day and i have completed 27. I do pranayama but i get tired when i do anulome vilome. So i hardly do it for 5 minutes. So can i console myself that if i do all the activities my gray hairs will turn into black. Please do reply me. Your affirmations will encourage me a lot. - Meditation overcomes deficiency of cosmic energy and ill-effects of lack of sleep. - During meditation cosmic energy flows through scalp and aids hair follicles to rejuvenate. This not only stops graying of hairs but also slow down your ticking biological clock. - A great anti-stress remedy to stop graying of hairs. 2. Drink 30ml of Triphala Juice daily. - Triphala is a potent rejuvenator of human body. - It is a great balancer of all three doshas viz., Kapha, Pitta and Vata. - Also a great tonic for hair and eyes. 3. Increase intake of plant based RAW whole foods in your diet. Lower intake of animals based foods, allergens and even processed food. - Physical activity increases oxygen intake and boost blood flow to the scalp. This supplies more oxygen and nutrients to hair follicles. 5. Practice daily... Balayam, Pranayama and Vibhakat Hastpad Asana. 6. If possible, install a good water softer in your bathroom. Soft water is good for your hair and Skin. -Stay away from pharma drugs. -Don't wash hair with hot water. -8 hours sound sleep is a must. -Don't let beauty products and make up sit on your skin, hairs, body, eye brows, etc., for longer time. -live a natural life and start following SAPTA Kriya. Gaurav Akrani - Your dedication and motivation are worth admiring.I appreciate your work,efforts and advices you give helping so many people. Can you let me know the exact technique of meditating?How do you meditate? Click Link below to learn how to meditate the right way. Excellent streaming video for newbies. viishal here...can you please tell me which company sells saw palmetto shampoo in mumbai?i searched the net and i didnt get any info..also could you please tell me if saw palmetto capsules are of any good? hi gaurav...where have u been ? hw much time will it take to have full head of hair ?? The thread is alive but i'm not replying to all comments personally cause people are asking same questions again and again without reading or taking preview of earlier discussion. I will reply only to new unique questions. I'm very sorry for this. I'm running short of time now-a-days. Time of recovery varies from person to person. It may take few months or even a year or more. Recovery depends on a lot of things. 2. What are your expectations of recovery? 9. Do you practice Balayam, Pranayama and Meditation regularly? * Pranayama - Helps in Oxygenation of the body. * Meditation - Boosts body's cosmic energy levels. 10. Do you engage in self-gratification? (Stop excessive maasturrbation also called 'hastmaithun' in hindi. I still don't understand why doctors say it is healthy. Moderation is normal but excess is extremely damaging to a male body. Ask similar questions to yourself. My dear friend, plz have a lot of patience as there is no magic bullet for fast recovery. I will reply to others' comments on Sunday. What are your doubts? How can I help you? If possible, shave gently on shiny bald area of your scalp for 2-3 days. This will help you to remove or minimize the thickness of resin like layer settled on your scalp. This resin like layer is actually an accumulation of dead skin cells, sebum, oil, etc. This layer acts as an obstruction for your new baby hairs to emerge. I still remember; I once have shaved my father's scalp for four consecutive days. Caution! Don't let your scalp bleed as it may injure your hair follicles. Please! Be very very gentle. After 2-3 days, start rubbing some shikakai paste on your scalp and let it sit for 30 minutes on your scalp. Then wash it off. Plz don't use chemical soap for washing. Continue shikakai treatment for a week. While undergoing this treatment, continue with balayam, pranayama, other physical activities that let you sweat more. Sweating removes toxins accumulated on your skin, scalp, etc. Always take a bath immediately with cold water after routine exercise. After few weeks, you may see some improvements. Sir! Picture won't reveal everything to me. Rather, I recommend you to get your scalp diagnosed from an experienced trichologist. People wonder they have a hair problem often it is a scalp ailment that obstructs well-being of hairs. hello sir its varun . I've been facing hairfall for about one year it started when i came to kota for iit jee . I m of 17 and having hairfall ,i have bald patches on my front right and left sides. I used to have flowless hair . I dont have any problem with thickness. I wondered if the hairloss is due to hard water of kota . All the students have this problem here can water be the factor. I understand you are a student and hence dependent on your parents for monetary support but still if possible make a small investment to maintain health of your hairs, skin, clothes, utensils, etc. 1. First, install a good water softener in your hostel bathroom. 2. Exercise daily. It improves oxygen intake, and sweating removes toxins from scalp and skin. 3. Just after exercise, always take a bath with soft cold water.Plz Never (DON'T) use hot water for bathing and washing hairs. 4. If possible also take a night bath before sleeping. 5. Use authentic herbal products for washing hairs and body bath. Read ingredients list before buying any of them. 6. Eat Right and Sleep Tight at least for eight hours. Sometimes hostel food is not at par with home-cooked food. To compensate nutrition deficiency or loss, add fresh fruits like apples, oranges, pineapple, etc., also add raw whole foods to your diet. 7. Important, make nutririch health juices your default beverages. 8. Om chanting (108 times) followed by Meditation (half an hour), Pranayama, Balayam must be regularly practiced with optimum interest. 9. Furthermore, install a good water purifier for drinking purposes. 10. Night Sleep in well ventilated dark room is also very crucial. Gaurav sir, I really liked ur article. Please tell me that what is correct time to do balayam. I mean, can we do it after eating food or before or on empty stomach. Further, I have read rubbing nail article on many forums and everyone is saying to do this technique twice a day for 10 minutes. Dont u think that 15 minutes 4 times a day is too much and it can harm ur body. I am sorry but I just curious because 1 hour daily for 6 to 8 months is too much time so I want to make this sure that I wont have any side effects. Is 15 minutes twice a day is enough? Also, please tell me success rate. I mean, if 100 people are doing this for 6 months then how many will get benefited (U hav experience) Thanks in advance for replying. Do it whenever you feel like doing it. See to it that you have an interest to do it. Don't force yourself to do it at some fixed time. I do it whenever if feel like doing it. For example, I do it when I have no other thing to do like during travelling, watch tv, before sleeping, just after meditation, etc. If you still want some fixed time, then I would recommend you to do it just after a meditation session. Cause after meditation, your body and mind are completely relaxed and stress free. Even your blood pressure gets normal after a meditative session. Q.2 For how long one should do balayam? As you already know, I have recommended to do nail rubbing for at least an hour but in four non-consecutive sessions of 15 minutes each. This suggestion is for people with severe hair problems like DHT, losing more hairs, thinning, graying, going bald, etc. If you have a healthy hairline but experience some irregular hair falls, then you can restrict balayam's intensity to only one or two sessions of 15 minutes each. So, for how time one should do balayam also depends on your current hair+scalp's condition and your expectations. Q.3 Are there any side-effects of over doing Balayam? This question is like asking someone are there any side-effects of walking an extra mile more. Only side-effect I think would be tiredness. Similarly, over doing balayam won't hurt any healthy person. However, if you have blood pressure-related ailments, then don't over do it cause it may (possibility) aggravate your BP. In general, there aren't any side-effects of rubbing nails. Q.4 What are the success rates of balayam? It seems you are little skeptical with this yoga and so asking me to give you a proof of clinical trials done on balayam. There isn't any to my knowledge. Ask yourself, why would someone fund research on this patent-free and profitless yoga? I can't say of others but me myself have experienced many positive results out of it. Therefore, I will surely continue doing it for my entire life without any skepticism. I won't endorse nor recommend you any specific brand cause what works good on my body may be sensitive to your body. Consult any wise ayurvedic doctor so that he / she can suggest you a herbal brand that suits your hairs and scalp's skin. As far as water softner is concerned, consult a plumber. I have installed zero b water sofner in my bathroom. from my personal experience doing balayam an hour or more is not a good idea...swami ramdev has strictly mentioned in other blog..rub your fingernail only twice a day 5-7 minutes...i used to do for 2-3 hours daily for one month but though my scalp tingled i used to get palpitation (rapid heart beat ) at night..but after doing it for5 mins twice a day before a month..i constantly feel needles piercing feeling as if hairs are growing...my hairline has improved a lot though.. u said u r not a doctor..but spiritual healer GEETA JHA has also mentioned to rub your fingernails only 5/7 mins twice a day for better result..and i am the proof of this... what do have to say about this dude???? On this very post, I have notified once before on 16th august 2011, that i was having a very slow but a definite regrowth of hair on my balding region. As of now its rate is still very low. I also noticed kind of a fungal infection on my scalp about 4 months ago which wasn't there before. I have been doing yoga(shirsh-asana included) since childhood butI have inherited this genetic disease from both of my paternal and maternal sides. Shirshasana alone was responsible for curing baldness in my father. But its not effective ALONE in my case. 1)I do SAPTA KRIYA regularly. 2)I do complete yoga for 1/2 hour. 3)I do BALAYAM for 3 hours throughtout the day. I have read above that many people don't feel any blood rush while doing Balayam. Just give it about 2 months and you will start feeling the rush. Also apply pressure on the nails. 4)I also do a SCALP EXERCISE mentioned by TOM HAGERTY in his website for 1 hour. That exercise is also really productive. Just search it on the internet and give it a try. I think what i am saying is 'my fungal infection' is infact that 'resin like layer' because first of all it started at a very later stage. Its also visible on my bald region.It consists of very-very small patches of dead skin and oil(although my skin is very dry). Its also visible even after shampoo. When a small patch leaves my scalp,it takes my 2-3 hairs with it. I think it is under some control with Homeopathy. Please suggest what should I do next. @siddharth I too had that problem . That white colour resin like layer used to be there but as i started doing balayam it gradually vanished . (that is the layers are not formed anymore and in its place hairs are present ). The formation of that layer indicates that one is balding . But am sure it(layer) wont develop once hair grows there . Keep doing balayam . Thanks a ton Gaurav for Such a great and informative blog. I will start the treatment tomorrow itself for my receding hairline.You have mentioned everything in detail. Can ypu please tell about the brand of Turmeric to be purchased from market as I dont have access to natural haldi..
@guarav sir will you ever reply your fellow indian ? Sorry for delay. I missed to reply you. Don't cut hairs for a time being. Look at mirror and find new changes. This will motivate you to do more balayam. If you wanna cut hairs still it won't be a problem cause your hair roots have a new life now and they will grow and grow. I don't use branded haldi powder. Now-a-days, adulteration is so rampant I don't trust any brand. I get my organic home processed Haldi (Turmeric) powder from my grandma. Sorry friend, I can't suggest you any Turmeric brand. Is shirshana a must ? must the bald patch be directly kept on the ground ? hi, i'm 31 year old female , i'm an indan last year i came to uk with my husband and a son ,i'm having a great amount of hair fall from past one year people say the weather conditions and water in uk is not good for black indian hair as most of the females have hair whitening and hair fall problems , water here is very hard full of calcium , i've very fine thin hair , i'm not facing whitening problem as others but my hairs are falling at alarming rate if i oil then fall is more . even i can see small hair are also falling . all my hormonal tests , iron tests are normal its , i've tried jaborandi tincture , arnica and cantharis tinctures it worked for a week and controlled the fall but nothing significant after a week but i continued but after using for 3 months its start giving me itching so i stopped. i do practice yoga but i'm not regular with that i use to do balayam but it irritates my husband . i feel depress when i see my real thin hair , my parting is getting wider i don't know what to do . Please reply. this is Neha here. I m in need of ur help. I had sent message on 5th March only and now also at 16th december. please reply soon. When I first started balayam I could feel the tingling in my scalp straight away. But then after awhile no matter how much I did it, the tingling had faded, and my hair began to thin again. So incidentally I had to go to a chiropractor for tense back muscles from working yesterday. I got an hour long massage and about another hour afterwards started balayam without thinking. Hey presto, the tingling sensation has now returned stronger than before. So I'm thinking that increased muscle tension might actually inhibit the transmission of nerve signals along the spine, something that might be worth considering if balayam is not working for some people. I have been doing Balayam regularly for the past 1 year . Now I feel like I need to increase the number of times I do it per day . Can I increase the number of times to 4 ? Sir please reply to me . I have been doing balayam for one year and I have had a great improvement. My question lies around the idea that whether applying oil is necessary .I do not apply oil at all .Is it mandatory that one should apply oil ? Should I apply or not ? Also I dont have a great improvement in the temple region . pls clarify these . This is Devendra Rathi, 27 years from India. I had beautiful hairs but for past two years Im continuously facing hairfall which feels pathetic as you know. Kindly provide the solution in a sequential manner. like all you people I'm also loosing my hairs. now i'm starting this yoga for my hairs. and hats off if this works and I am really sure that it will work. Actually i usually smoke weed everyday,i dont think that its harmful for me.I have started doing balayam regularly.Do smoking weed harmful for hair???? I am doing the finger nail rubbing for 7 minutes in the morning and 7 minutes before bed time. Is this long enough to be effective? Actually i had very good hair earlier but since last 2.5 years i'm loosing my hair very heavily. I lost my approx 150 hairs a day. I'm still no bald though but its visible when i wet my hair. Could you please tell me what's the main reason behind it???? I would be very grateful to you could help my anyhow. Hi, is this forum alive? can anyone tell which method is better?- one finger at a time or 4 together? or one by baba ramdev(all 4 nails simultaneously)? I am practising balayam for the last six month and i see a few new growing hairs in front. Will i get the new hair in the back portion and sides alos? please advive. its just been 1 week sice i've been practising balayam. since the past 2 days i am experiencing a lot of hair loss. i am fed up of seeing hair on pillow. u said that the shedding phase occurs in 3 months of practising. whats wrong in my case. you mentioned that balayam should be practised for 1 hr by using the technique shown in the video. My question is that should the practising time be the same if we rub all the 4 nails together?